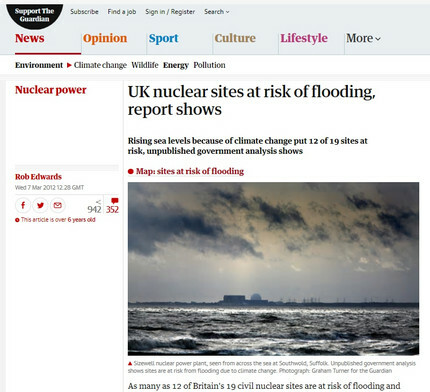 ・　As many as 12 of Britain's 19 civil nuclear sites are at risk of flooding and coastal erosion because of climate change, according to an unpublished government analysis obtained by the Guardian. Nine of the sites have been assessed by the Department for Environment, Food and Rural Affairs (Defra) as being vulnerable now, while others are in danger from rising sea levels and storms in the future. 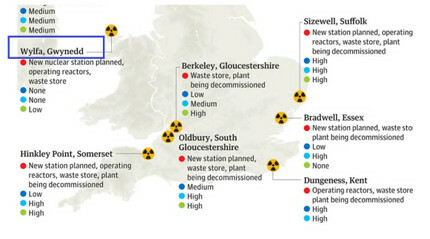 The sites include all of the eight proposed for new nuclear power stations around the coast, as well as numerous radioactive waste stores, operating reactors and defunct nuclear facilities. Two of the sites for the new stations – Sizewell in Suffolk and Hartlepool in County Durham, where there are also operating reactors – are said to have a current high risk of flooding. Closed and running reactors at Dungeness, Kent, are also classed as currently at high risk.